Welcome to the Kyushin Ryu Ju Jitsu West Sussex website. Many people may be asking themselves ‘What does Kyushin Ryu mean?’ It is one of the oldest names in the arts history. The original school being founded by the Eiroku period (1558-1569) by Inugami Sakon Shogen Nagaktsu. He compiled training documents listing basic principles of style, these specialised in striking techniques and methods of first aid and resuscitation. The most notable Master of the school, in later years was Shihan Yoshinori Equchi, he became one of the closest disciples of Doctor Jigoro Kano, who using methods from five principal schools founded Judo. The name can be broken down into three syllables and are explained thus; Kyu; means position of status or level, Shin; means aristocratic or supreme and refers to the class of society who originally practiced the system, Ryu; means style or school. Therefore ‘Kyushin Ryu Ju Jitsu’ translates to mean a supreme level of Ju Jitsu with supreme relating to the class of those who trained in the original schools and not a comparison to other Ju Jitsu styles. As you continue to read this we hope that you will enjoy our history and maybe search a little more into Ju Jitsu. It started in the late 1950’s when the name Judo was first heard by a young man, he was fascinated by what he was being told and joined a local club, the young man was profoundly influenced by the sport and decided to explore the arts even more. After several years training, and with his Sensei’s encouragement he found, and joined a local Karate club, by now it was the early 60’s. The young man worked hard and a few years later he moved further on by joining an Aikido club in the town of Dartford, Kent, studying Tomiki Aikido. It would have been no surprise to any of his Sensei’s that after 10 years of training with these revered gentlemen, he again decided to expand his learning and when a colleague opened an Atemi Jutsu club in the young man’s native town of Rochester, he was to progress very quickly and soon he became an instructor. This was the beginning of the clubs as they are today. It was now the very early 70’s and Ju Jitsu had taken a firm hold of Sensei Roger Wilkes. The first club was very small and as numbers grew we had to move into a larger building. In 1977 we moved into the newly completed Black Lion Leisure Centre in Gillingham, Kent. This move opened Ju Jitsu up to many as Kent had been shielded from this particular martial art and now it seemed everyone wanted to know what it entailed, so much so that our Sensei had to re-open the old Dojo as well as our new home to accommodate the numbers wishing to train. Very soon, and with the new black belts we were training, we began to open clubs throughout the Medway towns. Sensei had, by now, been graded to 3rd Dan and many more club members were also achieving their black belts. The original name of ‘Rochester Ju Jitsu Clubs’ was no longer appropriate, so we changed the name to ‘Medway Ju Jitsu Clubs’, the Medway towns being the collective name for the area we were in. By now Sensei Wilkes had been invited to take the group into a larger organisation, and although we kept our own identity, we joined. This opened the path to National and International coaching for Sensei Wilkes and in the not too distant future, it would afford the same for our current and prospective Dan grades. We enjoyed many years of international seminars and competitions and by the end of the early nineties, our Sensei was organising many of these events. When we opened a club in Gravesend, which is outside the Medway area, the name was changed again to ‘Kent Ju Jitsu Clubs’. In the early 90’s we left this association and joined another, continuing and increasing our national and international relations. Our group of clubs was now growing very rapidly. One of our black belts, Sensei Sid Martin moved to Bognor Regis, West Sussex as a result of his employment. Sensei Martin attended a local Ju Jitsu club and it wasn’t long before they recognised his depth of knowledge and quality of training, and as a result he took over the club and it became one of many clubs within the association. 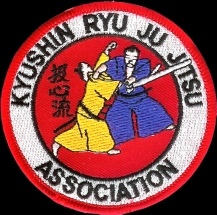 With clubs in West Sussex as well as our native Kent, the name ‘Kent Ju Jitsu Clubs’ no longer seemed appropriate, so the name ‘Kyushin Ryu Ju Jitsu’ was chosen by the clubs coaches as the name we would be known from this time onwards.